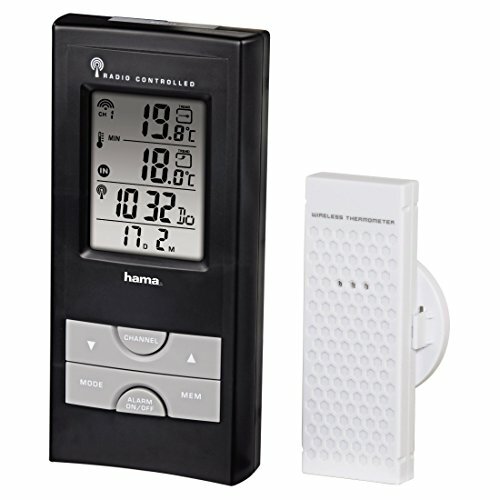 The Hama 'EWS-165' Electronic Weather Station consisting of a base station and an outdoor sensor (range: up to 30 m, 433 MHz ) though up to three wireless outdoor sensors can be connected. 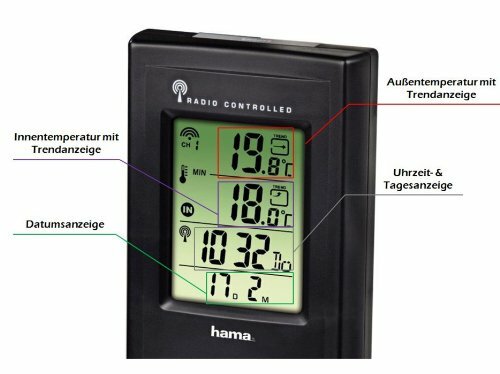 The temperature can be displayed in °C or °F and there is a data memory feature so that the Max./min forr indoor and outdoor temperature can be retained. 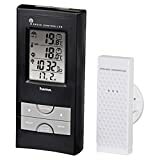 There is a radio-controlled DCF clock so that the exact time is retained in either 12/24h format, along with a calendar feature ands a dual alarm with snooze. Hama EWS-165 Stazione Barometrica Elettronica out of 5 based on ratings.